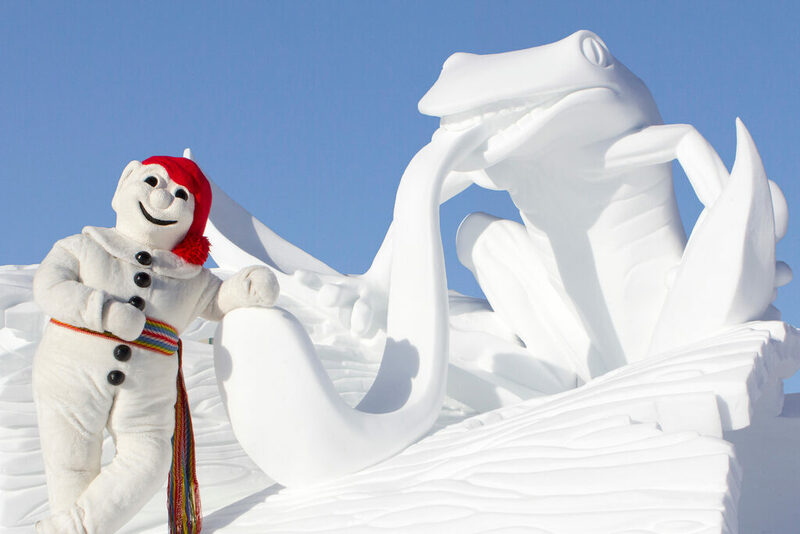 Carnaval is a wintry, family-friendly wonderland that comes alive when the temperatures drop in the heart of the “world’s snow capital” — Quebec City in Quebec province, eastern Canada. As North America’s only fortified city, the crenellated walls and castle-like structures of the Old Town are a stunning backdrop to the fun. Spanning three weekends, Quebec will host its annual carnival or Carnaval de Quebec, a tradition that dates back to 1894, from February 8-17, 2019. Set up above the banks of the St. Lawrence River and at public squares and venues around Quebec City, Carnival lets visitors pursue and observe a variety of winter activities. Whether it’s cross-country skiing along the park trails, sampling toddler rides at the outdoor amusement park, riding in a horse-drawn sleigh or dog sledding across the park grounds, families are sure to keep themselves occupied for days. And since the one-time entry badge can be used on all days, it’s great value too. Each day promises special events. On opening night Le Bonhomme, the iconic snowman ambassador for the winter festival, welcomes guests to his Ice Palace and kicks off three weekends of pre-Lenten celebration with a magical show. The Ice Palace, made of stacked and carved ice blocks, is at place de l’Assemblée-Nationale and it’s one of the festival’s most spectacular sights. Transparent ice bricks shipped in from Montreal (where all the oxygen has been removed prior to manufacture) are arranged according to a different architectural plan each year. Illuminated by an array of colorful lights, the Ice Palace reverberates fun. Over at parc de la Francophonie, the evening also heats up at Jos’ Camp Presented by Videotron, where dance music, beer and sausage pairings evoke the old Canada of logger days. 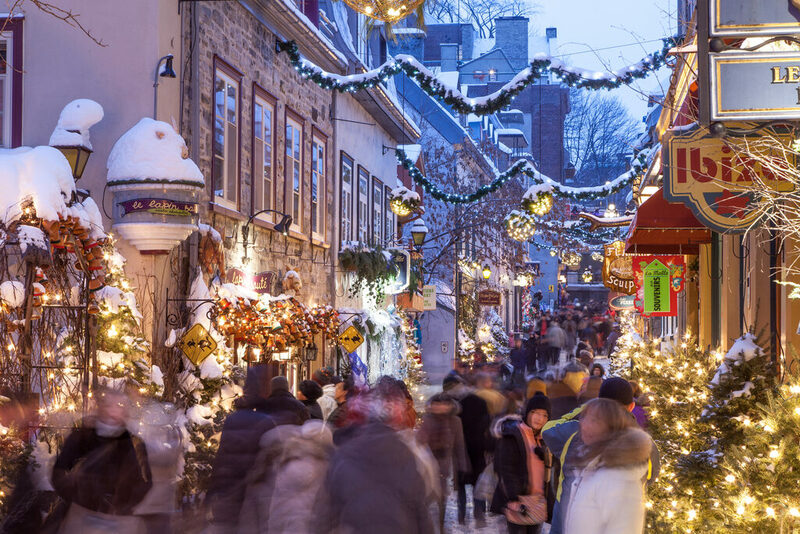 Other than some evening events and the liberal serving of Caribou, a tasty, alcohol and brandy concoction spiced with cinnamon that’s Quebec’s equivalent of gluhwein served at European Christmas Markets, Carnival is a very child-oriented affair. Things cool off pretty quickly as families make their way to Bonhomme’s World for activities set up just for them, including ice skating and gentle hockey. Don’t miss a chance to sample chilly treats from snow. D’erable sur la neige (also called tire sur la neige) is a participatory taffy created by rolling a popsicle stick through fresh maple syrup drizzled on a snow-topped table, scooping and rolling as it hardens with the cold. When you realize that Quebec province produces more than 70% of all maple syrup in the world, you can imagine how selective they are about the ingredients being used. Related activities around town abound, from dog sledding, sleigh rides, skating with Bonhomme, and snow-tubing to curling and ice sculpture workshops. Take a look at this fun video! Professional snow sculptors work their magic in a major international contest toward the end of Carnival’s three weeks. Families can both appreciate art and participate by voting on their favorite sculptures at place George-V.
A gamut of sporting competitions is scheduled throughout Carnival but beware, spectators watch from the chilly sidelines. Throughout the festivities you can observe (or participate in) extreme ice canoe races on the St. Lawrence River, giant ski races, winter yoga, and more. Be sure to check out the size of your fellow players before encouraging younger kids to participate in some of the contact sports. On the last two Saturday nights, don’t miss the popular and dazzling Night Parades in full regalia — floats, lights, dance troupes, music and Bonhomme leading the way. Families will love the talented, Cirque du Soleil like acrobatics taking place on many floats. With a constant program of shows, competitions, races, games, and tasty international food, Carnival will keep every member of the family entertained – but hotels fill up fast so be sure to book in advance. Advance reservations for tours and many of Quebec’s popular ice and snow attractions are important. Many families enjoy an overnight in the magically white and frosty Ice Hotel — picture a fancy igloo with rooms — which is erected each winter. The temporary ice hotel is made of 400 tons of ice and 12,000 tons of snow and, unsurprisingly, is not heated. Appropriate outerwear is included in rates. If you prefer the cold of the great outdoors, try your hand at weekend winter camping on the Plains of Abraham with Horizon 5 Plein Air tents. For more traditional housing, look for family package deals at Hôtel Château Laurier Québec, or check out our guide to many other fantastic fantastic family hotels in Quebec City. A Carnival “effigy” pass, which lets you in to all attractions (but not necessarily the VIP heated venues), costs only CAD$10 in advance or CAD$15 on arrival (though admission to many activities is free). Be sure to check out our suggestions for other fun activities for all ages in Quebec City. Just don’t forget, in Quebec City temperatures get to a minimum of -3º F and don’t generally get higher than 19º F, so dress accordingly. You can always go into one of the heated, sponsor tents to warm up or have a cocoa, or drop by the Discovery Pavilion and visit the multimedia Odysee exhibit about Canada’s history, that is open all year. To research warmer locales for Carnival fun, check out FTF’s roundup of Carnival and Mardi Gras celebrations worldwide.